The chips I often eat at lunch give me time to read a bit more broadly on learning and education than our typical SCORM minutiae. My hope is this balance helps us innovate and avoid the myopia that can overcome those obsessed with learning standards. I found my way to a great article/aggregation of thoughts from Brad Burnham at Union Square Ventures. Fred is suggesting that the education industry may soon face the same challenges that currently confront the music industry and the newspaper industry. Like those industries, education can be peer produced, delivered as bits, and curated by a community. Like the music and newspaper industries, the cost structures embedded in the education industry’s current business models may be very difficult to support in the face of competition from hyper-efficient, web native businesses. Unlike the music and newspaper businesses, education plays several roles in current society. As I’ve mentioned before, my wife is largely anti-technology with regard to learning and education. (Our kids don’t even watch TV, let alone sit at the computer for hours.) This creates a great dichotomy when thrown against the technological nature of my job and the people I’m working with on a daily basis. These folks love technology for its own sake. In truth, I think it results in great balance too… Will what we’re doing actually help learners? Is it accessible for someone who doesn’t love learning technologies for their own sake? I have no conclusions for you today. These kinds of questions, complicated, deep questions, are what continues to make my job fun. Can we at Rustici Software provide infrastructure that plays a significant role in the reduction of the cost of eduction? Can it be pushed toward “0 + bandwidth” as Brad suggests? 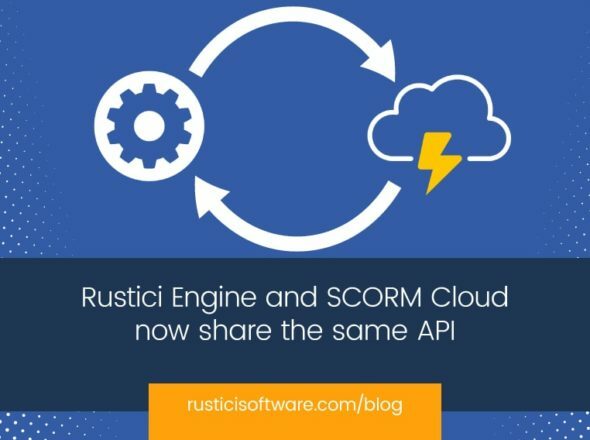 Can the SCORM Cloud play a role in that, and further, does SCORM even fit well with that intent?